Just the other day Fonera 2 was launched, and we already have the new Fonera 2.0n to wish for. Thanks to its new 802.11n WiFi is speedier than ever. And with its built-in USB hub the Fonera 2.0 management software allows users to connect external hard drives and other USB devices. This enables users to share data wirelessly, upload videos or photos automatically to YouTube, Flickr, Picasa and Facebook, or download torrents or files directly from BitTorrent, RapidShare, and Megaupload without a computer running at the same time. Additional features include the ability to backup files to a hard drive, print, or access a remote webcam via WiFi, and convert an HSDPA or 3G dongle to WiFi. 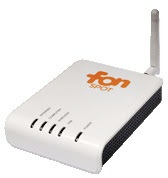 Considering the Fonera 2.0n router consumes less than four watts while downloading, while PC averages nearly 100 watts, I can't think of a better gadget to have around the house for most of the 24/7 daily computer tasks.